Employers across the manufacturing and engineering industries are continuing to face a number of new challenges in the workplace due to changing employee demographics. With around 10,000 baby boomers (those born between 1946 and 1964) retiring from across all industries every day according to Investopedia and many Generation Xs (those born between the early 1960s and early 1980s) in senior management roles, the need for those within the manufacturing industry to engage with, attract, and retain new blood is more vital than ever. However, as a sector traditionally seen as ‘dirty and dangerous’, long-associated with poor health outcomes, and renowned for requiring individuals to work long hours, there is an ever-growing awareness of the need for considerable change – both perceptively and practically. Ian Woodward, Director of Group UK Sales at Filtermist, a leading manufacturer and marketer of oil mist, fume and dust extraction equipment, discusses how the desires and demands of the younger generations differ greatly from their older peers, why there has been such a shift in awareness of workplace health, the negative impact traditional operations continue to have on the older generations, and the ever-increasing demands on employers from the younger generations. Plus, he looks at and outlines the actions manufacturing and engineering organisations need to be taking now to secure their futures. “According to the Manufacturing Technologies Association (MTA), the industry accounts for 23% of the UK’s entire GDP, with over 7million jobs dependent on it. Manufactured goods account for almost half of all exports and 70% of total R&D spend. The industry has also benefitted from enhanced productivity – with the Office for National Statistics (ONS) reporting manufacturing productivity in the UK as being 12% higher than the national average in the second quarter of 2017. However, the potential next generation of workers still perceive the industry as low skilled, impersonal, and offering no real career prospects. And, it’s not only the opinion of young people - a survey by one of the world’s leading manufacturers of custom prototypes and production parts, Protolabs, revealed that the sector remains associated with outdated terms such as ‘manual labour’ and ‘assembly lines’ by a quarter of senior business decision-makers across the UK. 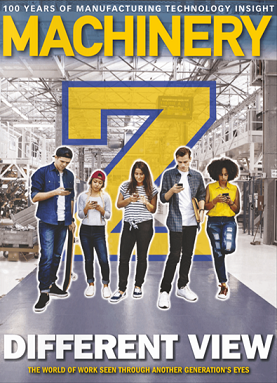 Subsequently, employers are struggling to attract the next generation of workers – both ‘millennials’ (those born between the early 1980s-1995) and ‘Generation Z’ or ‘iGen’ (1995-2012) – not only due to the image of the sector, but the fact that these younger cohorts have very different expectations, outlooks, and skills than their older counterparts. Perhaps one of the greatest differences is that millennials, and to an even greater extent Generation Z, have never really known a world without technology – from the rise of the internet and smart phones, to Instagram and a wealth of other social media channels, technology plays an integral part of every aspect of their daily lives, and enables them to be ‘social’ 24 hours a day. Whilst increasing levels of automation are prevalent within the manufacturing industries, continued investment in the latest machinery and equipment has historically been lower than in other industries, whilst research and development, which enables organisations to benefit from up-to-the-minute advancements, is also lower. Despite this, the manufacturing industry is undergoing a transformation to the fourth industrial revolution, with physical production being more widely integrated with digital technologies. This network of physical objects embedded with electronics, software, and connectivity, is enabling organisations to essentially change the way they operate - with the ‘intelligent rise of smart devices’ allowing businesses to enhance their engagement with, and analysis of, data. A recent report claims that through this, new business models are emerging which are seeing organisations embrace these advanced technologies and introduce sophisticated tools and processes such as industrial robotics, artificial intelligence, and enhanced data analytics. In fact, whilst many commentators claim that this industrial revolution is still in its infancy, a study by SAP found that almost a third of processes across the sector already incorporate embedded intelligence, with 34% of manufacturers having a strategy to apply Internet of Things technologies into their processes – something that is likely to excite and enthuse the next generation of workers. Alongside this, however, is the need for employers to ensure that they have the right skills within their organisation to be able to maximise all potential commercial opportunities offered by these technological advancements. According to The UK Commission for Skills, almost a fifth of employers within the manufacturing sector admitted to having skills gaps across their workforce compared to a sixth of all employers across all industries, with the EEF supporting this claim by outlining that the UK manufacturing sector currently has a ‘chronic skills gap’. In response, the Government launched the Year of Engineering at the beginning of 2018 – a campaign dedicated to tackling this skills gap through raising awareness and understanding of the industry and inspiring a new generation of inventors and innovators. In addition to technology, and the provision of comprehensive training, a further core driver for both millennials and Generation X is their desire to make a positive impact within their careers – to be involved in decision making and to be a part of the bigger organisational picture, rather than simply ‘doing a job’. In fact, recruitment firm Monster claims that almost a third of those under 25 would take a salary cut of up to 20% to work for an organisation with a mission they care about, and where they see themselves making a difference. A further shift in perception by this new generation of workers is in relation to their overall health, and the increasing awareness of the impact of poor indoor air quality. There have long been concerns around the effects of unclean air ‘outside’, but what has never really been considered – until now – is the detrimental effect of the air we breathe within our working environments. Manufacturing and engineering industries have traditionally had a reputation for being inherently ‘dirty’, primarily due to the fact that pollutants are a natural by-product of the processes involved. Drilling, grinding, milling and turning all produce airborne pollutants through the use of fluids sprayed by machine tools to help lubricate the tool or keep metal components cool. It’s been well-documented that exposure to metalworking fluids (MWF) – through both skin contact and inhalation – can cause a range of health issues including allergic dermatitis, acne, and asthma. Whilst larger particles such as dust enter the nose and mouth, finer particles such as oil mist and oil smoke pass through human ‘filters’ and travel into the respiratory system and/or the bloodstream. And, with particles from some modern machines tending to be smaller than those previously generated – the risk of health issues to workers can be increased due to traditional filters being unable to cope with these submicron particles. In fact, the World Health Organisation (WHO) reports that over 65 million people currently suffer from chronic obstructive pulmonary disease (COPD) with 3 million dying from it each year, making it the third leading cause of death worldwide. In the UK, occupational respiratory disease is estimated to result in approximately 12,000 deaths every year, with the Health & Safety Executive (HSE) reporting an increase from 2% to 45% in reported cases of Occupational Hypersensitivity Pneumonitis (OHP) between 1996 and 2015 linked to exposure. Making sure that the air within a work environment is kept clean can thus have a significant impact – lowering the levels of short term health issues such as headaches, fatigue, and nausea, as well as reducing the risk of longer term, and potentially debilitating, illnesses such as lung disease and cancers (according to the British Lung Foundation 77% of cases of lung disease in the UK are not smoking-related as many believe). Within its ‘Good Practice Guide for Safe Handling and Disposal of Metalworking Fluids’, the HSE outlines the importance of proportionate and effective control measures in reducing exposure to metalworking fluid pollutants, with the ‘effective design provision of engineering control solutions such as LEV and mist filtration systems’ a vital element. It’s clear that times are changing within the industry and that employers are facing new challenges and increasing demands from the next generation of workers. And, it’s also evident that in order to attract and engage with the younger generations, organisations need to ensure that they balance technological innovation, training and mentoring, and clean, comfortable working conditions, with operations that are person-centric, inclusive, and highly adaptable.